Along the Grand Strand, homes and condos on the beach are more often than not used for vacation rentals, while those who are moving here or can afford the best choose a home on the Intracoastal Waterway. Nothing compares to walking out your back door, stepping onto your boat, and spending the day fishing, pleasure riding, or playing with jet skis. Waterfront property is becoming harder to find and more expensive every day. New home communities on the Waterway are rare, so when a new one begins development, it doesn't take long to sell out. Just across the Swing Bridge, off the original Highway 17, (Ye Olde Kings Highway) heading towards Little River is one of the rare new developments on the Waterway - only 32 private homes overlooking Harbourgate Marina. The homes are Cape Cod-style three-story cottages, with parking on the ground level and two floors of living space above. Elevators are an option for those who prefer a safe and stair-less entry to the living area. There are two floorplans, with three bedrooms and 2.5 baths, from 1768 to 1912 square ft. Homes come with all the upgrades: 9-ft ceilings, crown molding, granite countertops, stainless steel appliances, wood flooring, luxury bathrooms, 3-car garages, and so much more. 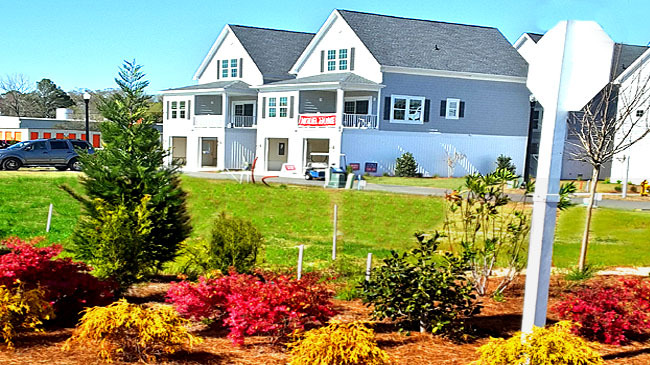 Lots are sodded and landscaped, and will be maintained by the Homeowners Association. A community boat dock will offer limited private docking, and many of the homes will be directly on the waterfront or have a water view. Affordable prices start at $339,900, and financing is available up to 100%. Membership to the Freedom Boat Club is included as a special bonus for those who don't want the hassle of owning their own boat! Kids will attend Ocean Drive Elementary and North Myrtle Beach Middle and High Schools which are located just up the street. One of the area's favorite waterfront restaurants, Filet's, is next door just across the water. The location couldn't be more convenient - Hwy 9 and Seacoast Hospital is a couple of miles north, and North Myrtle Beach is just a quick drive in the other direction, with the newest shopping complex, and the best restaurants at the beach. The community is outside the city limits as well, which means much lower taxes! The developers have done all the work for you. 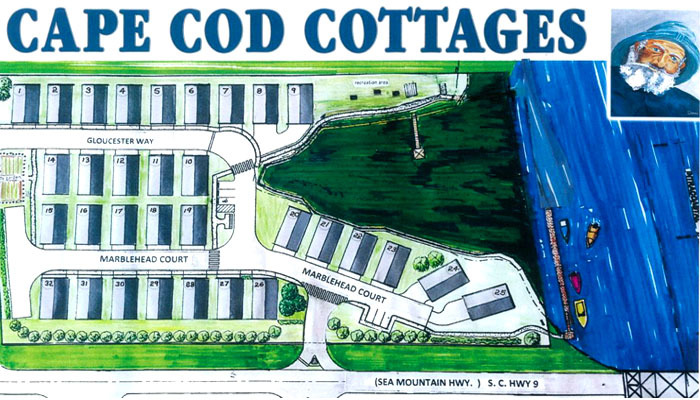 All you have to do is move in and start enjoying the lifestyle at "Cape Cod Cottages on the Waterway". Our agent, Patti Kielty has all the information you need to get one of these fabulous homes before they are gone. Let her be your buyer's agent and negotiate for you with the builders!